Flexible graphite and PTFE are commonly used in cryogenic sealing. Natural gas popularity is growing exponentially because of its low cost, low risk to transport and store, and its status as one of the cleanest burning fossil fuels. With increasing global pressure to reduce greenhouse gas emissions, the need to meet growing energy demands while reducing these emissions is more important than ever. Hydrocarbons are comprised of hydrogen and carbon that release energy as they combine with oxygen to form H20 and CO2. Dry wood offers a combustible ratio of carbon to hydrogen of about 10 to 1. Coal replaced wood and powered the industrial revolution with a ratio of 2 to 1. Petroleum such as kerosene has a ratio of about 1 to 2. Natural gas is composed mostly of methane (CH4), which has a ratio of 1 to 4. That is a 40 times efficiency gain from wood to natural gas and eight times from coal to CH4. This improvement in energy efficiency also makes the energy cleaner because less ash and residue are created. Natural gas can also be a major contributor to the greenhouse gas effect because of its hydrocarbon intensity and leads to the importance of properly sealing the product in gasketed joints. There is a global revolution around natural gas—with modern technology in extraction, it is being piped and shipped globally (Image 1). Liquid natural gas transportation is unique because it must be liquified, and to do this, it must be cooled to approximately -260 F (-162 C). At this point, the gas condenses into its liquid form. This is important because liquified natural gas can be compressed to approximately 1/600 its original volume, which substantially increases the amount that can be both shipped and stored. 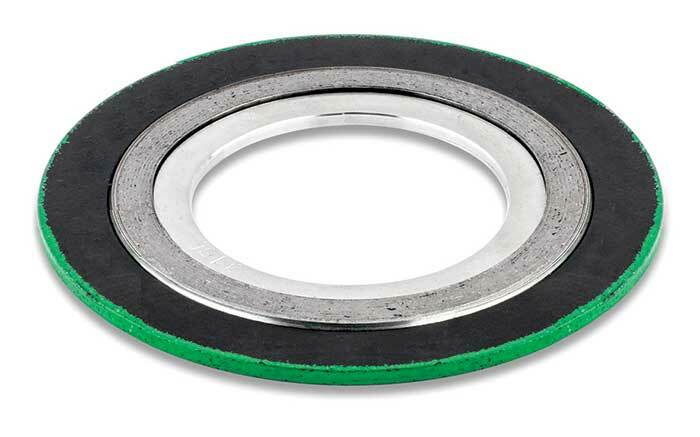 From a sealing standpoint, cryogenic applications are problematic due to the extreme cold temperatures that cause expansion and contraction of the bolted connection. Elastomer-based materials become hard and brittle when exposed to low temperatures and are not recommended to exceed -100 F (-73 C). At low temperatures, elastomer-based material does not conform well to the sealing surface and flange serrations, which can cause a leakage path. Brittleness of a gasket material can cause it to lose its recovery properties, particularly if the application cycles through wide temperature fluctuations. Also, brittleness can cause a gasket material to crack, which can be catastrophic and cause safety concerns. When talking about cryogenic sealing materials, there are generally two main types that are used: flexible graphite and polytetrafluoroethylene (PTFE). It has a low temperature range of -400 F to -450 F (-240 C to -268 F). Spring-back or material compressibility and recovery show excellent properties for both thermal and mechanical cycling. It can also be used in a semi-metallic format in conjunction with metal components to create a spiral wound gasket (Image 2), a corrugated metal gasket with flexible graphite cover (Image 3), or a Kammprofile gasket. Metallurgy selection is important due to brittleness that can be found in ductile materials at low temperatures. Ideally 300 series stainless steel or nickel alloys are acceptable. The ease of cutting into complicated shapes provides high versatility. Flexible graphite gaskets can be fragile, so extra care needs to be applied when handling or transporting. Material can break off and contaminate the process (without an eyelet on the gasket ID/OD). It has a low temperature range of -350 F (-212 C). The material does not become brittle at low temperatures. 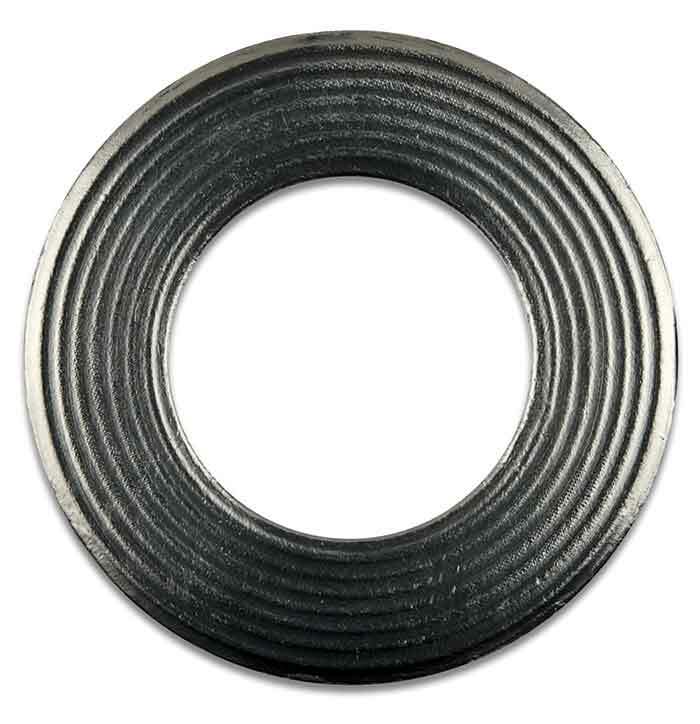 As in the case of graphite, it can also be used in a semi-metallic format in conjunction with metal components to create a spiral wound gasket, or a Kammprofile gasket. The metallurgy selection is important due to brittleness that can be found in ductile materials at low temperatures. Eyelets are not required for pure applications such as oxygen service. Material can be welded to create large one-piece gaskets without a dovetail. With virgin PTFE material, creep is a concern. But with advancements in various filler material, this can be negated or drastically reduced.